Every year Diablo, the magazine of the San Francisco East Bay, highlights a select few of the East Bay Area’s medical practices. 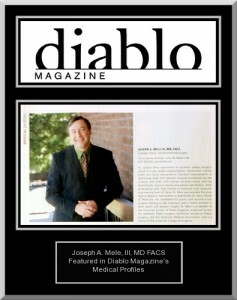 The current Diablo magazine features Board Certified Plastic Surgeon, Dr. Joseph A. Mele, III, MD, FACS, as part of its annual Medical Profiles. 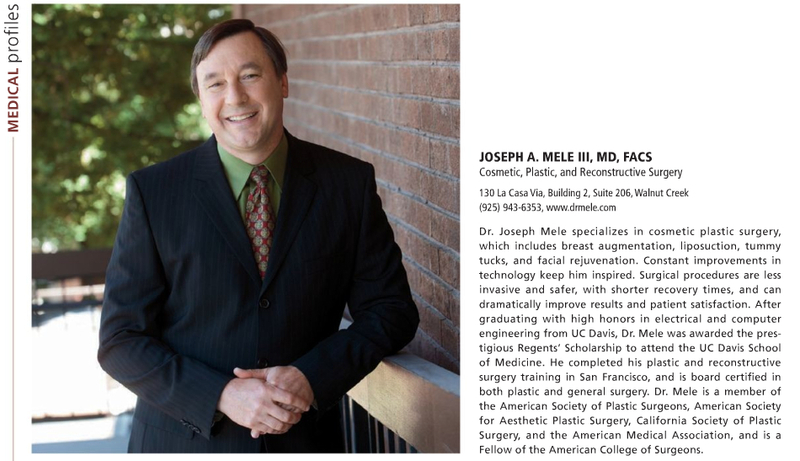 The full profile can be viewed here -> Dr. Mele’s Medical Profile. If you are not familiar with the magazine, Diablo is a monthly. It has been published since 1979, by Diablo Publications located right here in Walnut Creek. Diablo has received numerous awards for its editorial and design, including the 2006 Maggie Awards for Best Overall Publication and Best Regional & State Magazine in the consumer category. 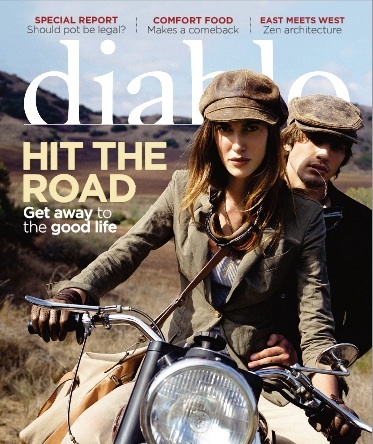 Diablo covers everything: medicine, travel, entertainment, celebrities, culture, recreation and food. I can tell you from personal experience, Diablo’s annual Gourmet East Bay is a fund raiser worth attending. Good food, a raffle and silent auction are the highlights of the evening. Gourmet East Bay 2010 will be held at Broadway Plaza in Walnut Creek, on November 6, 2010, from 7 untill 10 PM. Proceeds benefit the Food Bank of Contra Costa and Solano and Project Open Hand. Thanks for giving back, Diablo. To visit the Gourmet East Bay 2010 web site click the picture above.